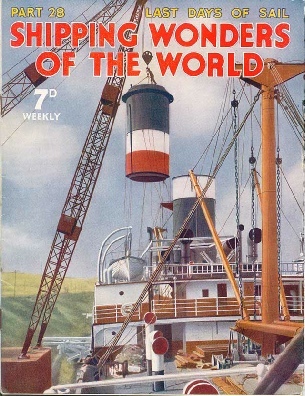 Part 28 of Shipping Wonders of the World was published on Tuesday 18th August 1936. It included a centre photogravure supplement featuring the last days of sail, which formed part of the article of the same title. This week’s cover shows the SS Diplomat at Eastham, on the Manchester Ship Canal. Some of the bridges over the canal were too low to allow the Diplomat to pass underneath, and it was necessary to remove her funnels to allow her to clear them. The Diplomat’s gross tonnage is 8,240, her length is 482 ft 1 in, her breadth 58 ft 5 in and her depth 33 ft 5 in. (Left) AN AMERICAN NAVAL DIVER wears three-fingered watertight rubber gloves, unlike the British diver, who generally works with bare hands. 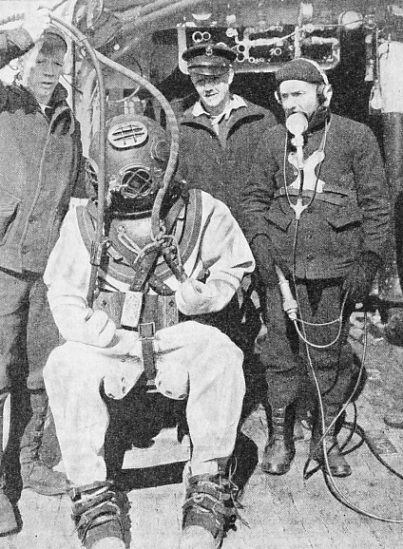 The diver is preparing for a descent in connexion with the salvage of a sunken submarine. He is equipped with a telephone which keeps him in constant touch with the men on deck. Since the London Midland and Scottish Railway acquired control of numerous services between Great Britain and Ireland, as well as of certain Firth of Clyde services, many interesting paddle and screw steamers have been replaced by fine modern vessels. Many of the cross-channel packets that ply round the coasts of Great Britain are being replaced by fast motorships and turbine steamers. This is particularly noticeable in the Irish Channel services. Only one hundred years ago the Royal William, an auxiliary paddle steamer built at Liverpool for the Irish services, made a number of transatlantic crossings and was one of the first passenger steamers ever to do so. About 1850, when the railway services to Holyhead were increased in efficiency and quality, a large number of paddle steamers were built to take the mails and passenger traffic to Ireland. This chapter, by Peter Duff, gives a brief sketch of these interesting early vessels which formed the cross-channel fleets owned and controlled by various railway companies now forming part of the LMS Railway. In the last fifteen years as many as thirty new steamers have been put on these services by the LMS in the place of the older vessels. A LONDON MIDLAND AND SCOTTISH CARGO VESSEL on the Holyhead, Dublin and Greenore service, the Slieve Bloom (above) has a gross tonnage of 1,279. Built in 1930, she has a length of 300 ft 3 in, a beam of 44 ft 8 in and a depth of 14 ft 9 in. She and her sister ships carry about 700 head of cattle in addition to cargo. 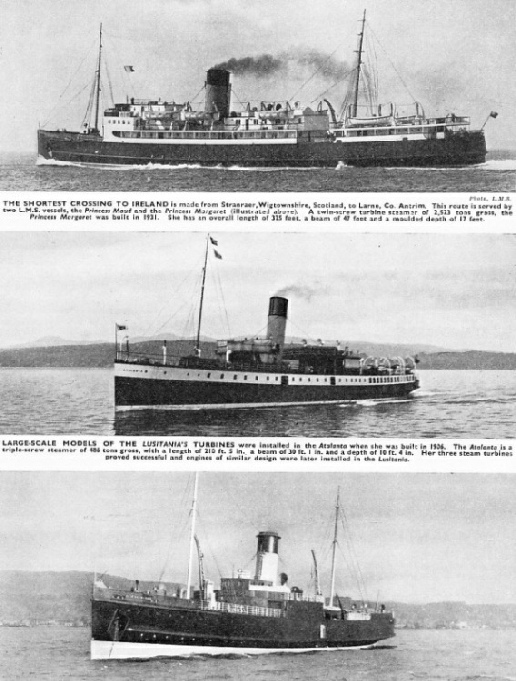 In 1936 there were five vessels of the Slieve class employed in the service. The harbour of Durban is formed by a natural lagoon, the only opening on a long stretch of the eastern coast of South Africa. A deserted wilderness just over a century ago, Durban now handles more cargo tonnage than any other South African port. This chapter is by Sidney Howard and is the eighth article in the series Great Ports of the World. 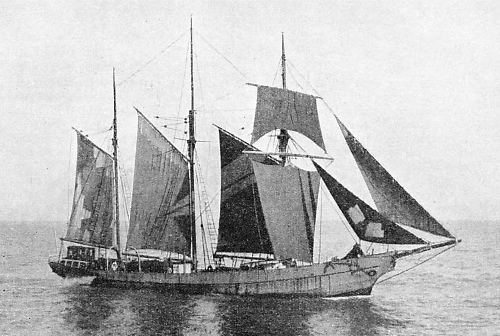 The Chella, illustrated above, was built at La Seyne, near Toulon, and claims to be the fastest vessel on her route, with a speed of about 21½ knots. She has a length between perpendiculars of 426 feet, a beam of 62 feet, a depth of 37 feet and a draught of 22 feet. Her gross tonnage is 9,000 and her net tonnage 4,800. Her deadweight carrying capacity is 3,000 tons, cargo being carried in four holds, two forward and two abaft the machinery space underneath passenger accommodation. Accommodation is arranged amidships on a promenade deck, on the deck below it and on the upper deck. At the forward end is a first-class dining-room, an unusual position for this important section of the ship. There is a considerable amount of luxury accommodation in the cabin space on the bridge deck forward, ordinary cabins being abaft this on either side of the boiler hatch and on the deck below. Quarters for second-class passengers are arranged at the after end. The total passenger capacity is 178 first-class, 192 second-class, and 102 third-class. Propulsion is by single-reduction turbines, developing a total of 14,300 shaft horse-power at 187 revolutions. Diesel generators are sued for auxiliary purposed in the main engine-room. The Chella follows modern french practice with her squat funnels, cruiser stern and curved bow. 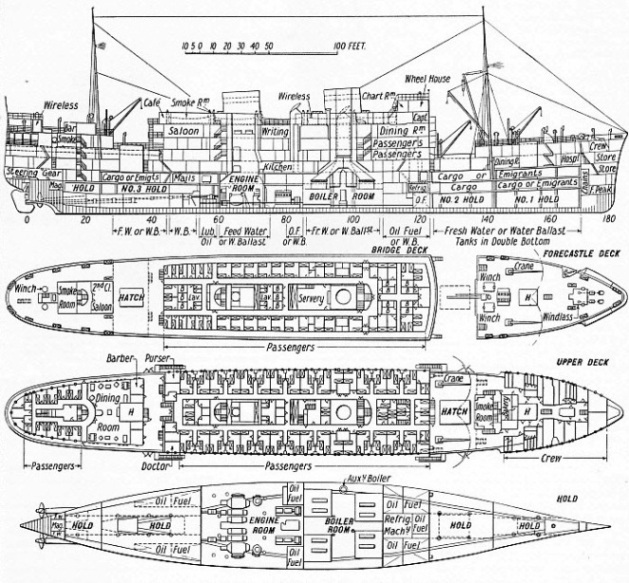 This is the twentieth article in the series on Merchant Ship Types. 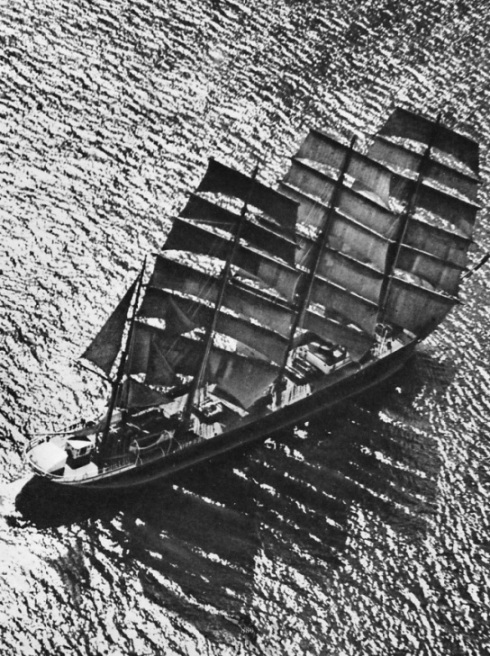 The twentieth century, with its remarkable scientific progress, its desire for speed and its overpowering economic forces, is now seeing the inevitable disappearance of the large sailing vessel. In a few years’ time there will be few sailing ships left on the seas except those used as training ships or, of course, the innumerable yachts and small pleasure craft. In this chapter Frank Bowen explains why it is economically impracticable for sailing ships to compete with the fast powered vessels which satisfy the requirements of modern business conditions. He mentions many of the historic vessels with have only recently been broken up and many of the famous square-riggers which still exist in Erikson’s grain fleet based on Mariehamn. This chapter is exceptionally well illustrated with a fine photogravure section. A FRENCH BARQUE OF 1,930 TONS GROSS, the Germaine was built at Havre, France, in 1900, as the Ville de Belfort. She had a length of 260 feet and a beam of 39 ft 5 in. ONE OF THE SURVIVORS of the British coastal sailing vessels, the Irish Minstrel, a wooden three-masted schooner of 154 tons gross. 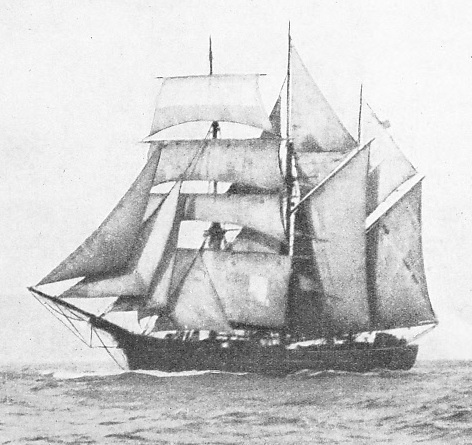 She was built at Dundalk, Co. Louth, Ireland, in 1879. Her length is 99 ft 12 in and her beam 25 feet. This photograph was taken at Newlyn, near Penzance, Cornwall. 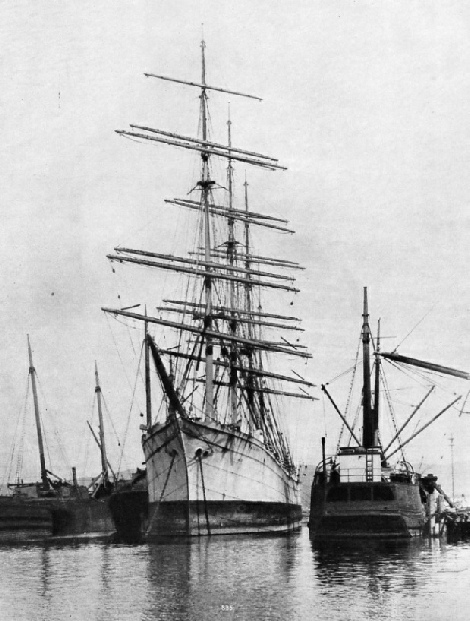 The sailing vessels that were used as trap-ships and decoys during the war of 1914-18 were even more exposed to peril than many of the steamers. Sailing ships were frequently at the mercy of winds and tides, and it was more difficult for them to conceal their identity. This chapter is by Lieut.-Com. E. Keble Chatterton and is the third article in the series Mystery Ship Adventures. The article is concluded in part 29. THE SHORTEST CROSSING TO IRELAND is made from Stranraer, Wigtownshire, Scotland, to Larne, Co. Antrim. This route is served by two LMS vessels, the Princess Maud and the Princess Margaret (illustrated top right). A twin-screw turbine steamer of 2,523 tons gross, the Princess Margaret was built in 1931. She has an overall length of 325 feet, a beam of 47 feet and a moulded depth of 17 feet. LARGE-SCALE MODELS OF THE LUISTANIA’S TURBINES were installed in the Atalanta when she was built in 1906. The Atalanta is a triple-screw steamer of 486 tons gross, with a length of 210 ft 5 in, a beam of 30 ft 1 in and a depth of 10 ft 4 in. Her three steam turbines proved successful and engines of similar designs were later installed in the Lusitania. THE LAST BRITISH BARQUENTINE surviving in 1936 was the Waterwitch. Built in 1871 at Poole, Dorset, she has a gross tonnage of 207, a length of 112 feet and a beam of 25 ft 9 in. She is used in the coasting trade, and many Trinity House pilots have qualified for their sail training in her. LAID UP IN OAKLAND CREEK, California, USA, the Daylight is a steel four-masted barque of 3,756 tons gross. 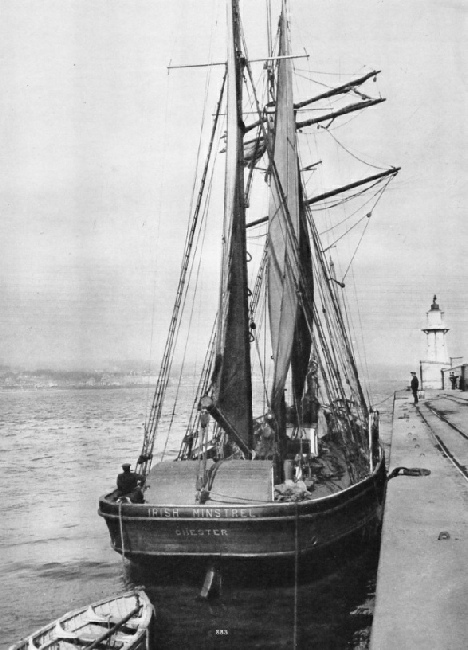 She was built at Port Glasgow in 1902, and about thirty years later was converted into a lighter. She has a length of 351 ft 6 in and a beam of 49 ft 1 in. The Olivebank also appears on the cover of part 50. ONE OF THE LARGEST LINERS calling at Durban is the Italian quadruple-screw turbine steamer Giulio Cesare. A vessel of 21,900 tons gross, she was built in 1922 at Newcastle-on-Tyne. She is 634 feet long, with a beam of 76 ft 1 in and a depth of 46 ft 4 in. 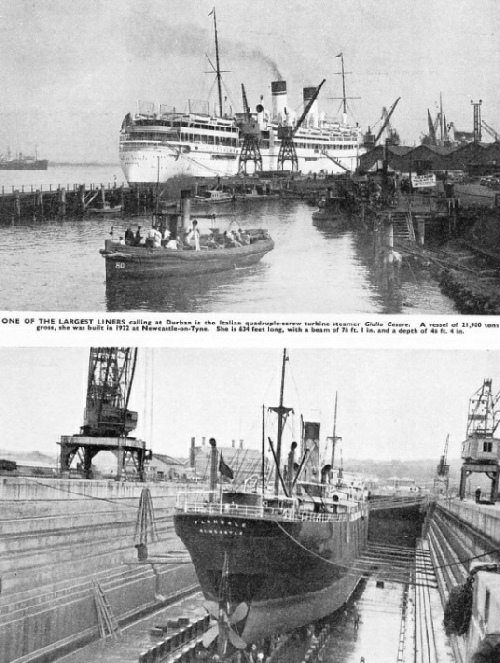 THE PRINCE EDWARD GRAVING DOCK was the largest south of the Equator when opened in 1925 by King Edward VIII, then Prince of Wales. The length of the dock at the bottom is 1,150 feet and the width at entrance 110 feet. The dock is situated at Congella, in the south-west corner of Durban Bay. This photograph shows the Farndale 4,235 tons gross in the graving dock. 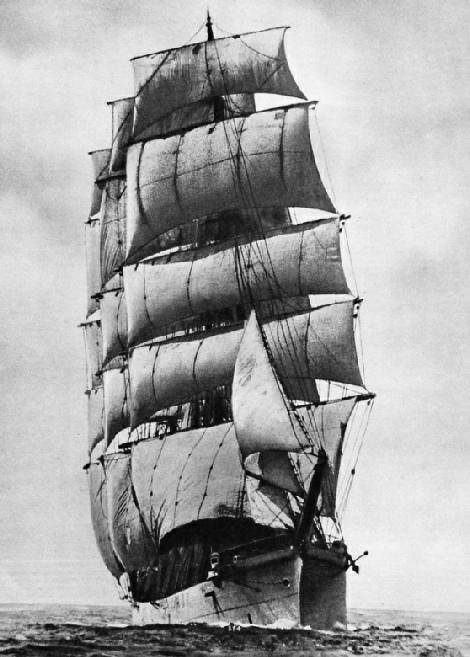 ONE OF THE MOST SUCCESSFUL Q-SHIPS was the Mary B Mitchell, a three-masted topsail schooner of 210 tons. She was built at Carrickfergus, Co. Antrim, in 1892, and was registered at Beaumaris, Anglesey. The Admiralty took her over during the war of 1914-18 and she operated from Falmouth, Cornwall, fitted with collapsible gun-houses on her poop. On December 2, 1916, she sank U 26 and on June 30, 1917, she sank two more submarines in the Bay of Biscay.